Even though 2013 sucked worse than the worse sucky year ever, and I was happy to see it die in the fiery depths of a thousand burning suns, I think I'm constitutionally incapable of ending the year without making a note of the various inconsequential crap I keep track of over the course of the year. In 2013, I knitted 50 scarves, 15 lap robes, and 400 hats for charity. Next year the numbers are likely to be significantly lower, since I won't be out on disability for five weeks due to organ removal. At least I hope that's the case, because DAMN. In 2013, I read 107 books, including audiobooks, traditional books on my Kindle/iPad, and textbooks. I don't have the exact breakdown on genre, etc., because I don't really care that much about this particular obsession, but the big winners are Literature and Fiction, Science Fiction and Fantasy, and Generic Non-Fiction. Again, it seems unlikely that I'll read this much next year, since I'm back in student mode and hope to remain healthy, as well. In 2013, I took two college courses, bringing my total earned credits to 188. No, I still don't have a degree. Yes, I suspect I will have to graduate eventually. BUT NOT UNTIL I'M GOOD AND READY, STOP PRESSURING ME. In 2013, I spent 87 days away from home. A small percentage of those days was for pleasure, most were for business travel and family emergencies. I suspect my 2014 will be comparable, with (hopefully) fewer days for family emergencies and more days for pleasure. In 2013, I bought one car. I've been driving "family cars" since 1990, and honestly - to start the new year I felt like I wanted to get something that was fun to drive and suited me down to my toes, without having to take into consideration such things as "back seats" and "cargo space." 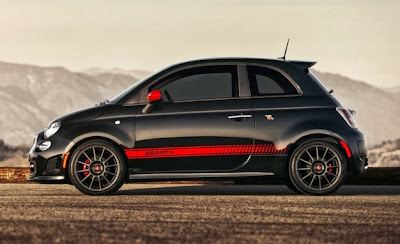 So at the end of December I bought a 2013 Fiat 500 Abarth, 160 horses of turbo-charged impracticality and fun. * Go, me. *We kept the Jeep, as well. Because there's no way a full-grown Giant Schnauzer or a half-grown human being will fit into the back of my sweet new ride. So the Jeep's been relegated to being parked on the street rather than in the garage, like the orange-headed step-child that it is.